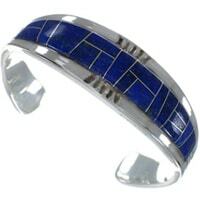 Many people love our Native American lapis bracelet selection and for a wide assortment of reasons. Some people love the top quality stones we use, and some love the fact that we have so many different styles to choose from. 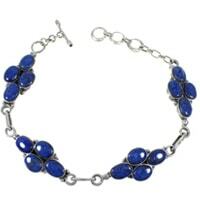 The appearance of lapis is a beautiful deep blue color, which is sometimes accented with small flakes of golden pyrite, creating a stunning contrast. 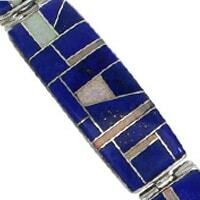 Our collection includes a wide variety of lapis bracelets in many styles. 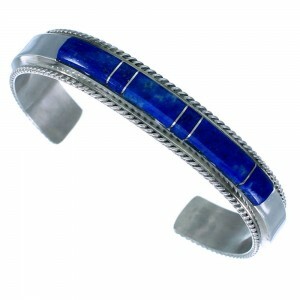 Whether you are looking for a great lapis cuff bracelet or lapis link bracelet, we have plenty of styles in stock. 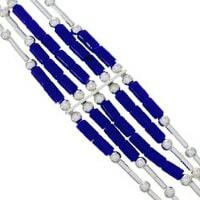 We have incredible prices on every item in our catalog, and lapis bracelets are no exception. 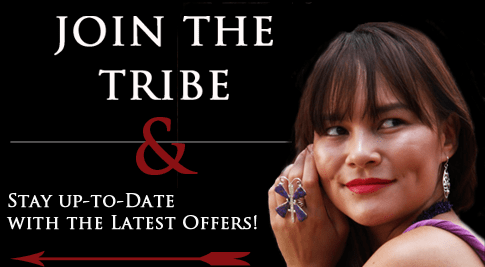 Our artists design all the styles that we offer for beauty and ease of use. 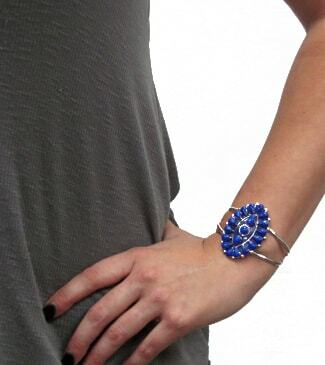 Some people prefer a more contemporary southwestern style, like our stunning blue lapis bracelets, while others may love a large traditional lapis cuff with stones covering the entire piece, whatever your desire, we have the right lapis bracelet to fulfill your needs. 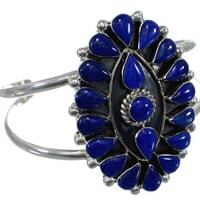 Lapis has had a long and varied history, while it has been mined in Afghanistan for over 6,000 years, its use in Native American Jewelry is considered a relatively recent development. 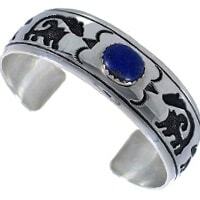 The somewhat recent addition of this stone (recent in historical terms) has by no means slowed down its implementation into all forms of Native American jewelry, lapis bracelets being no exception. 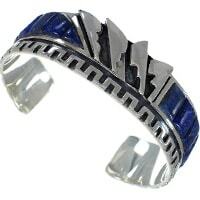 The various tribes of the Southwest have mastered the skills involved with stone working and jewelry making, and did not miss a beat when lapis was first introduced in significant quantity. 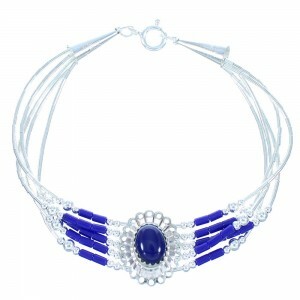 They have been producing amazing feats of artistry in American Indian lapis bracelets and Native American bracelets ever since. 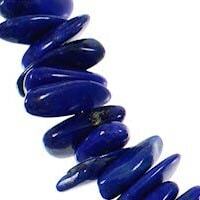 Made up of lazurite, lapis is put in the rock family. It does have a small amount of minerals imbedded into it, the most common and desirable being pyrite or "fool's gold" as it is more commonly referred to. Pyrite gives some lapis stones a gold speckled facade, which in the right ratio is highly sought after by many collectors. 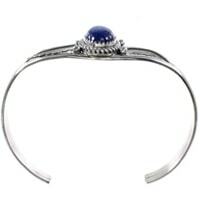 The beautiful canvas of the deep blue lapis and the occurrence of dazzling pyrite specs inspired artists to incorporate the gemstone into superb blue lapis bracelets. 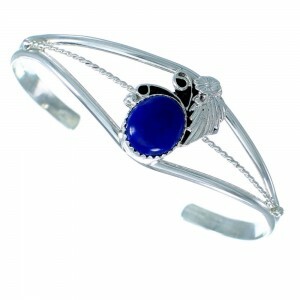 Browse through our selection of brilliant lapis bracelets to find the piece that's right for you. We have a great selection at the best value around. 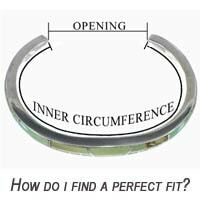 Take some time to look around and find the next accessory for your collection.